These Roadside Safety Discs can be seen from over 5000 feet away by oncoming motorists in any direction. Protect yourself and your family in all emergency situations, simply activate each light with a single click. The Magnetic Base allows you to easily attach the discs to the side of your car. 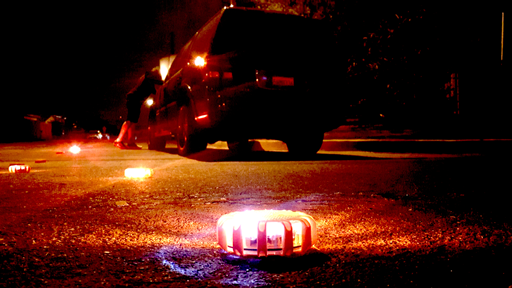 You can put them on the ground around your vehicle in seconds and create a wall of protective safety light alerting oncoming traffic and keeping you and your family safe. They are waterproof and durable enough to withstand being run over and they keep on working and continue to shine bright! Now when you need an Emergency Beacon you get the toughest, brightest and best available. And when you need a flashlight or work lantern you simply click the button and you have both. The LEDs are so bright they can be seen from 5000 ft. away in any direction. If you’re caught in an emergency simply press the button and your Safety Discs instantly turn into flashing SOS safety beacons. Plus, these Safety Discs comes with a magnetic base for hands free use. So you can use the Safety Disc features, the work lantern and the magnetic base feature to stay safe and keep both hands free in case of an emergency. 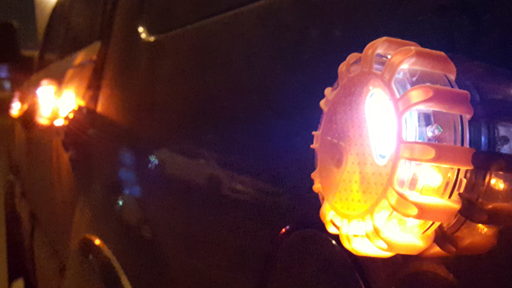 Create a wall of safety light around you and your vehicle instantly with a push of a button. Product Dimensions 3 pack disc set with zip pouch 3.9x3.9x1.3"
Ultra bright, tough, compact and lightweight the 1TAC Emergency Safety Discs are the most powerful, universal and dependable emergency safety light tool on the market. The light offers 15 LED emitters with a lamp lifespan of 100,000 hours. It boasts a Magnetic Base and a Utility Clip for hands free use. There are 9 light flashing modes including a Work Lantern mode for changing a tire, working on the engine or just to see your way through the dark. Shock, crush, water proof and dust resistant. Digitally regulated output to maintain constant brightness. Operate all light modes from one switch for ease of use. SUPER-BRIGHT: 15 individual LED lights are synchronized for maximum brightness, visibility and effectiveness. Can be seen over (5000 ft / 1524 m) in any direction. Features 9 adaptable settings: including Strobe / SOS / Work Lantern Mode. LONG-LASTING: Up to 36 Hours of powerful, non-diminishing brightness from 3 AAA batteries. The bright LEDs boast an extended 100,000-hour lifespan. TOUGH & RELIABLE: Shock proof, crush proof, water proof. Totally weather resistant, designed for use in heavy rain. Its durable hard plastic body and shock-resistant hard rubber edges are designed to endure rough handling. SMART DESIGN: With a streamlined, compact design and anti-slip grip holds fast in your hand. It can hang or stand on-end as an emergency lamp or can attach to any metal surface for hands free use with the magnetic base. A lightweight, ultra high-powered Magnetic Base is built into the rear base of the case and allows you to attach your Safety Disc to most metal surfaces for easy hands free use. Attach it to the side or back of your car or truck or the back of a trailer, boat or RV. The Emergency Safety Disc is also designed with a handy built in Utility Clip that is seamlessly integrated into the body casing and folds open and closed for easy access and stow-away. This Utility Clip feature offers another hands free option for hanging in hard to reach places where you need light but can’t use the Magnetic Base. 3 LED Emergency Safety Discs are included in the 3 Pack, plus a convenient storage bag. Batteries are not included. Once 3 standard AAA batteries or 1TAC AAA batteries(recommended) are inserted you have up to 36 hours of run time and a lamp life of over 100,000 hours. The Safety Discs are shockproof, crushproof and rainproof, a must have for every vehicle including car, truck, RV, boat and motorcycle. Superior visibility: Super bright LED array can be seen up to 5000 Ft. away at night; It can be used for traffic control, as a warning light, as a rescue beacon, and for any other emergencies. They can also be used for recreational activities such as camping and hiking and other outdoor activities. 9 different flash modes, included SOS rescue and a LED Work Lantern. Providing a variety of useful light modes which can help in different situations. Makes a Great Gift for First-Time Car Drivers, for fathers, mothers, sons, daughters, grandparents and friends. 100% satisfaction guarantee. Each disc has 15 built-in, high brightness LED lights. 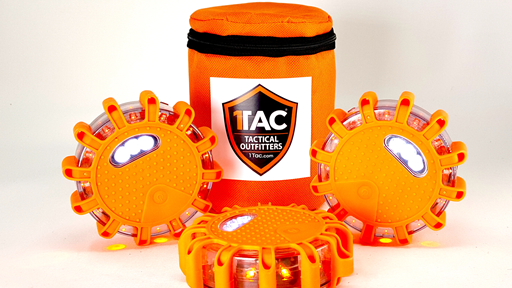 1 TAC Discs have a light array with up to 5000 ft. visibility, even in the heavy rain and fog. These discs have a lamp life of up to 100,000 hours and features over 36 hours of continuous run time on one battery charge. Each disc runs on 3 AAA batteries. 3 1TAC high performance AAA batteries are recommended but Safety Discs can use any standard 3 AAA batteries. Perfect for any situation including roadside emergencies, oncoming traffic warnings, directional road marking, emergency vehicle discovery and helicopter landing, various rescue activities, hiking, camping, backpacking, outdoor lighting, or any other night activity where safety light might be needed. 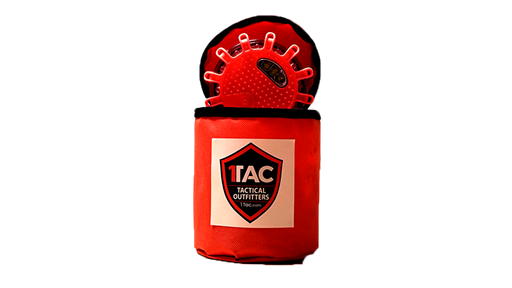 The 1TAC Emergency Safety Disc operates all 9 Flash modes from one simple, easy to use button. From the on and off switch you can cycle through the various flash modes by pushing the button again, over and over until you get the desired flash mode that best fits your situation. You also have a Work Lantern for seeing your way through the dark or working on your car, whether you have engine trouble or a flat tire. The Emergency Safety Disc from 1TAC is the most handy and useful Emergency Safety Light you will ever buy. The DMV recommends you have a set of these in every vehicle.